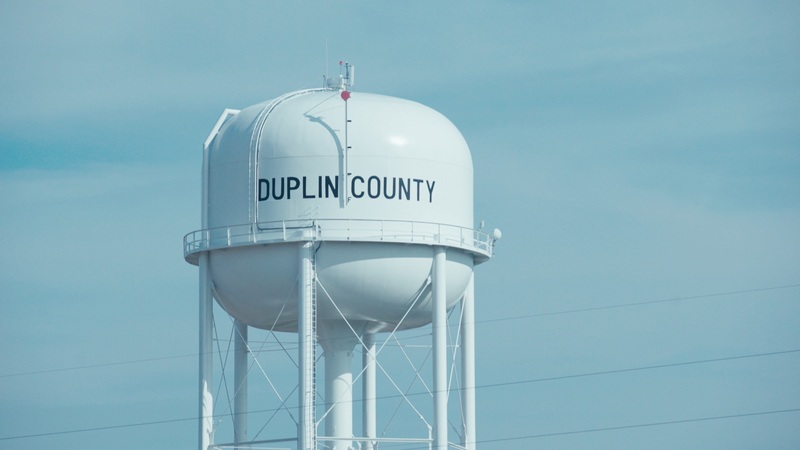 Duplin County, North Carolina raises more hogs than any other county in the United States. All photos by and property of Swine Country Documentary Project. Hurricane Florence was the third hurricane in 22 years to threaten Eastern North Carolina with rivers of hog waste. This is the first in a two part series by documentarian Sol Weiner about a community’s long fight against state regulators and the hog industry for environmental justice. “I phoned in a complaint one morning of a contract grower spraying hog manure during a rain event,” remembered Devon Hall, program manager for the Rural Empowerment Association For Community Help (REACH) in Duplin County, North Carolina. “Later that day I received a phone call from someone who was trying to find out who I was. He says, ‘Who is this?’ and I'm saying, "Wait a minute, you called me. Who are you trying to reach?" “Somebody at this number called and reported me,” the voice explained. Hall was taken aback. The only other person who knew about that phone call was the person at the NC Department of Environmental Quality, or DEQ, who fielded it and took down his information. When Hall co-founded REACH in 2002, the hog industry in Duplin County, North Carolina had already wrested a significant share of the local economy, beginning in the 1980s. The state’s hog population (over 9 million) is second only to Iowa. The hogs are raised in concentrated animal feed operations (CAFOs), where they live in close quarters, increasing the risk of illness for hogs and humans. The hog waste is contained in large sewage lagoons, which overflow during heavy rains, and are used to spray hog manure onto neighboring fields—often spraying neighboring homes in the process, as far as three miles away. Because many are situated in North Carolina’s Coastal Plain region, these hog facilities are particularly susceptible to impacts from hurricanes, as demonstrated most notoriously in Hurricane Floyd in 1999, and again during Hurricane Matthew in 2016. More devastation is expected from last week’s Hurricane Florence. Hall and others founded REACH as a platform for low-income people and people of color in Duplin and Sampson Counties to address a host of social and economic problems in their communities, eventually committing itself foremost to cleaning up the hog industry’s pollution. Hall’s phone incident with the contract grower—a hog farmer under contract with a major agriculture corporation—was just one example of the pattern of industry harassment that became the focus of a civil rights investigation under Title VI of the Civil Rights Act of 1964, which prohibits recipients of federal funding from discrimination in their decisionmaking. The North Carolina Environmental Justice Network (NCEJN) and two other groups filed a complaint against DEQ in 2014, charging the agency with corruption of its own citizen complaint process. The EPA found that DEQ had indeed violated their own guidelines by intimidating citizens who reported violations. However, the harassment pointed to an even deeper problem. By continuing to issue permits for industrial hog farms, DEQ was sanctioning the same hazardous conditions that were the subject of citizen complaints. To date, only 10 of the nearly 2,300 hog farms in North Carolina have opted for a cleaner method of waste disposal than the lagoon system. Multi-billion dollar livestock corporations, such as Smithfield Foods, claim such methods are too expensive to implement. An eight-barn hog CAFO with a massive lagoon to store hog waste. Activists and journalists have long called attention to the industry’s and state’s discrimination in waste management practices—primarily that hog facilities are located disproportionately in Black, Latino, Native, and working-class communities. In the process they’ve won some key victories from the state’s General Assembly. For example, following crises like Hurricane Floyd in 1999, state law prohibited construction and operation of new hog facilities and lagoons. Even with sustained public outcry, DEQ renewed permits in 2014 for nearly 2,000 hog and poultry farms in the North Carolina. Duplin and Sampson Counties alone host 40 percent of the state’s swine population. That, activists argue, is DEQ’s flawed permit process and rubber stamp at work: if an industrial facility meets the guidelines and it’s good for business, there’s a place for it in eastern North Carolina, the state’s poorest region. Right away REACH’s legal team—led by non-profit EarthJustice and the UNC Center for Civil Rights and joined by co-claimaints NCEJN and the Waterkeeper Alliance—began preparing a Title VI complaint against DEQ which, like all other state regulatory agencies receives a share of its budget and operating costs from the federal government. To date, only 10 of the nearly 2,300 hog farms in North Carolina have opted for a cleaner method of waste disposal than the lagoon system. Multi-billion dollar livestock corporations, such as Smithfield Foods, claim such methods are too expensive to implement. Hall was encouraged. Title VI’s language echoed REACH’s point that the hog industry was operating in, and perhaps even targeting, communities of color, and that DEQ was participating in that discrimination by granting permits for thousands of facilities. He also believed that the states would never enforce civil rights without federal oversight. The lagoon and spray-field method of waste disposal is dangerous and outdated but still allowed by state permit. Since its inclusion in the 1964 Civil Rights Act, the fight over Title VI has centered on two questions: First, can an ordinary citizen file a lawsuit to enforce Title VI in court—lawyers call this a “private right of action”—or are only government agencies able to enforce Title VI through their own administrative processes? Second, does the violation of the civil right(s) in question need to be intentional to violate the Civil Rights Act, or do policies that have the effect of discrimination regardless of intention—a standard known as disparate impact—violate Title VI as well? REACH believes it’s critical that citizens and agencies should be able to enforce Title VI in court. But despite Title VI’s activist-history, a series of court rulings beginning in the 1980s ensured that there is no private right of action. Since individuals can’t bring Title VI claims to court themselves, REACH and other organizations like it are left with one option: filing complaints directly to federal agencies. Such bureaucratic red tape, however, is exactly what Congress sought to avoid with Title VI. For the decade and a half following the passage of the Civil Rights Act, the Department of Housing, Welfare, and Education proactively enforced Title VI for its original purpose: school desegregation. Additionally, federal agencies used a prerogative that they were given under Title VI to promulgate regulations to ensure that Title VI actually had teeth—to make specific efforts to eliminate discrimination in education, healthcare, housing, and the other areas of society that the federal government touches. These regulations themselves implied a private right of action, so individuals could sue to enforce their specific promises—not just the general promise of Title VI. Courts tended to agree with Congress that the best way to enforce Title VI was to grant a private right of action to enforce agencies’ rules and regulations. But the Supreme Court’s pronounced rightward shift in the 1980s gave new power to a decades-long conservative fight to defang civil rights law. Courts limited the impact of certain sections of Title VI prior to that, but had never suggested that citizens could not bring their own lawsuits. After twenty years of see-sawing on the two key sections of the statute, the Supreme Court heard Alexander v. Sandoval in 2001. Justice Scalia wrote a majority opinion which was devastating to REACH and organizations like it. The Court decided that while Title VI itself may imply a private right of action, that right only covers the statute itself—and the statute only applies to intentional discrimination. There is no private right of action to enforce the regulations that agencies created, or the disparate impact standard that those regulations might use. Basically, the decision meant that unless you could prove you’d been subjected to intentional discrimination, no court would even hear your case. “Sandoval,” said Mark Dorosin, co-founder of the Julius Chambers’ Center for Civil Rights, “undermined Title VI completely—not just for environmental justice but for education, housing, and really the range of discriminatory impacts, which is the controlling model of race discrimination in America. The Sandoval decision produced not just resentment but unhealthy air, soil, and water. “It shouldn't take the people in the community to tell [DEQ and EPA] what to do when that's their job,” Hall explained. Can Young Black Farmers Save Atlanta? Two urban farming programs for Black youth aim for more than good food—they want to reclaim ancestral practices for a freer, safer Black Atlanta. When Hurricane Matthew dumped more than 15 inches of rain and set off historic flooding in the parts of the state most densely populated by livestock, it created problems—for the farm operations themselves and for the land and people nearby.